Guess who got to put out a REAL fire with a fire extinguisher for the first time? I did! There are so many other "firsts" that I have experienced here at the University of Wisconsin-Madison, both related and unrelated to my research. I was excited to learn that I would be spending my summer in Madison because I had never been to Wisconsin. Unlike my hometown, Madison has beautiful lakes that enhance the city. The university is full of life, even in the summer, and overflowing with people who are thrilled about learning. 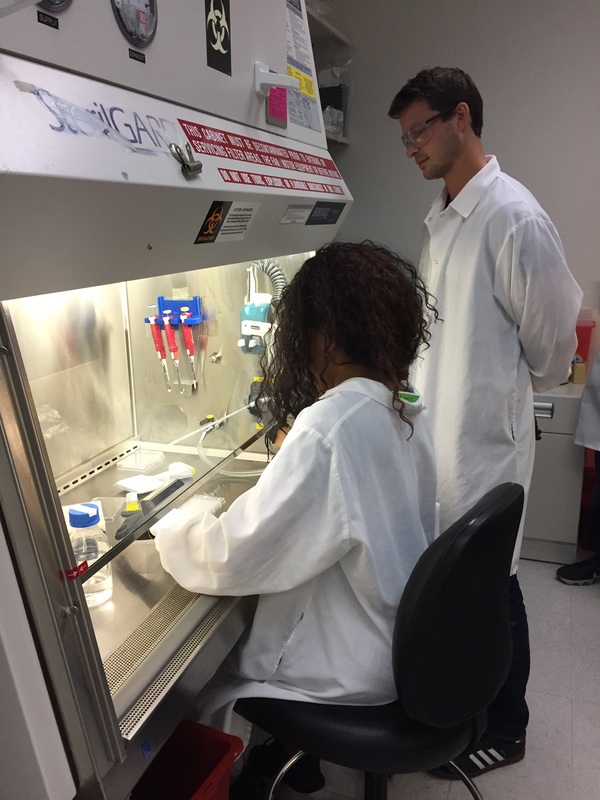 My research this summer is focused on the optimization of stem cell culture. Traditionally, cells are cultured, or grown, on a plastic called tissue culture polystyrene (TCPS). Although it is low cost and widely used, it creates a poorly defined surface for cell studies. To gain more control over cell behaviors, my lab has synthesized a copolymer coating to allow for chemically defined stem cell culture. My goal is to discover how to make this polymer more effective and to apply this material to multiple substrates. I have no previous research experience, so I was extremely grateful for such an amazing opportunity. I get the best of both worlds working in a materials science and engineering lab as well as a biomedical engineering lab. I have learned more than I ever expected to learn in only a month. I became well-informed of the importance of personal protective equipment (PPE) after accidently getting potassium chloride sprayed into my eye (and how amazing an eyewash station can be)! Putting out a large fire during fire safety training was quite scary but extremely empowering. I have not taken a biochemistry course, but after everything my mentor has taught me, I feel like I have! This REU program has impacted me in so many ways. It is rewarding to be a part of a team and aid in reaching a higher goal. It is crazy to think that I am contributing to my lab even though I just got here and did not know a thing about cell culture. Being surrounded by professionals who are passionate about their research has inspired me to continue to pursue my goal of attending graduate school. I have gained professionalism, patience, and lab friends along this journey. I have been confused and frustrated at times, but every researcher experiences this. I have learned to improvise when things do not go as planned, and to persevere when I feel stuck. Over the next couple of weeks, I will be volunteering at a high school science camp. I am looking forward to teaching the students some of the things that I have learned through my research experience. I also plan on exploring more of Madison, and attending many activities and events that the university has to offer. I am sure that there will be many more "firsts" to come. Hi Brittany. I greatly enjoyed reading your essay! :-) You make the experience very relatable. I'm sure many students will be inspirted by your essay to try out summer research as their own "first." One minor recommendation is that you say where you are after "Unlike my hometown, [name of hometown], Madison..."